The Saffron R Task Stool fit more spaces where work happens around the office, business or at home. This versatile Saffron task stool provides customizable comfort with a 5” ratchet back height adjustable system, independent back angle adjustment for the perfect low back and lumbar support with height adjustable footring. Rise to finish the next task at your sit-to-stand workstation, counter height, drafting table or jeweler’s workbench. The Saffron R Task Stool is designed with all the features ergonomists demand: quality materials, commercial grade workmanship and easy to adjust ergonomic function. All backed by lifetime/10years warranty. 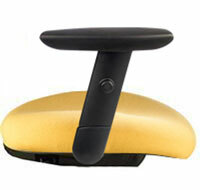 Personalize your own task stool by selecting upholstery color, seat size, arms option and pneumatic lift and casters. This custom Task Stool normally ships within 3 weeks. Assembly required. The colors you see on your computer monitor or mobile device should only be used as a guide and are not absolute. • Oval tube Polyurethane arm pad 4-1/4"W x 10-5/8"
Click the button below to add the Saffron R Task Stool Upholstered Back, Custom Options to your wish list.